Medical Marijuana has been a tool for Ryan physically, emotionally, and spiritually. 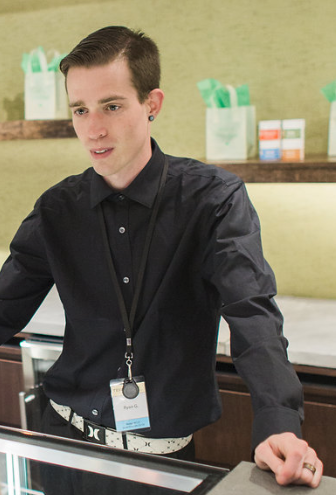 Cannabis has helped him keep a more regular diet which stems into my daily well being, and produces fast-acting and long-lasting relief without side effects when he experiences G.I. tract issues. He has also been able to manage both anxiety and depression through medical marijuana without any assistance of SSRIs or mood regulating medication. On a more spiritual level, he uses it as a tool to look at himself and his day from multiple perspectives. “With focus it enables me to take a more comprehensive approach to problems, and handle things head on when I can fully understand them by seeing them in their ‘exploded view’.” he said. In his new role as Educational Director, Ryan feels fortunate that he has the opportunity and responsibility of reaching a large portion of Pennsylvania’s patient base. “I look forward to spreading high quality accurate information that will empower the average cannabis patient to effectively use it as a medicine and regain control of their well being.” he stated. “There is an opportunity to help people at the root of their problems, where many existing methods are focused on the leaves.” He fervently believes that by helping people become capable of creating better lives for themselves, we are leaving the world better than we found it. “I've been known to go on 5 hour knowledge binges which is how I accumulate all of my useless and useful knowledge.” He will research the newest studies on medical advancements, chemistry, space travel, etc. Other days he is more recluse and finds joy in taking his dog on walks or holing up with his favorite PC games. We are lucky to have you, Ryan!